As 2014 draws to a close we can reflect on what a very successful year it has been here at Airedale Springs. 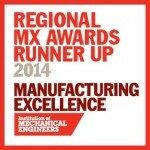 Following on from our awards success in 2013, Airedale Springs became the runner up in the inaugural Regional Manufacturing Excellence Awards in February 2014 and the following month we received 3 awards in the Keighley Business Awards including the prestigious award for ‘Overall Business of the Year’. We welcomed two more employees into our 25 year club. The club was created in 1970 for employees who have completed over 25 years continuous service, of which there are now 46 members – 17 of our current 32 employees have achieved this mile stone. Our production team saw the addition of three new members of staff including two CNC Apprentice Setters. The extra staff were needed to compliment the additional CNC spring and wire forming equipment installed throughout the year, which included another FMK2 and a CNC compression spring coiler (above) extending our capacity up to 10mm wire diameter. We are delighted with our 3D printer which has enabled us to manufacture many complicated parts to check the fitting of some complex wire form products without the need for expensive gauging. This investment has proved very popular with many of our customers. We continue to invest in new equipment to further enhance our product range and capacity – early next year we will see the completion of the installation of another wire former which has been purchased to allow greater flexibility across our mid range wire sizes. In 2015 Airedale Springs will be celebrating 70 years in business and we are planning some key events to celebrate this special anniversary – details of which will be released in the new year. So after a very busy and successful year, all the staff at Airedale Springs would like to wish our customers, suppliers and associates a very Happy Christmas and a prosperous New Year.